A frivolous $250m lawsuit from one of the biggest jokes in the House of Representatives? Why of course. Possibly the most ridiculous figure in a Congress that also has Steve King and Louie Gohmert, among many many other nincompoops. News of Devin Nunes' lawsuit was greeted with widespread ridicule on Twitter and other social media Monday night. This Trump brown-noser, with his own sordid ties to the Russians, was an abomination and a blight on government before his absurd lawsuit. This only confirms what we already knew. A disgrace. US Representative Devin Nunes has sued Twitter and a handful of users for defamation and negligence, accusing Twitter of acting as a “vessel of opposition research” for hosting accounts that insulted Nunes. The suit is the latest of several filed against social media platforms for alleged bias against conservative politicians, none of which have made substantial progress in court. The Minecraft one must have touched a nerve. And some reaction, including from Liz Mair herself, as she deals with this wackjob of a congressman. 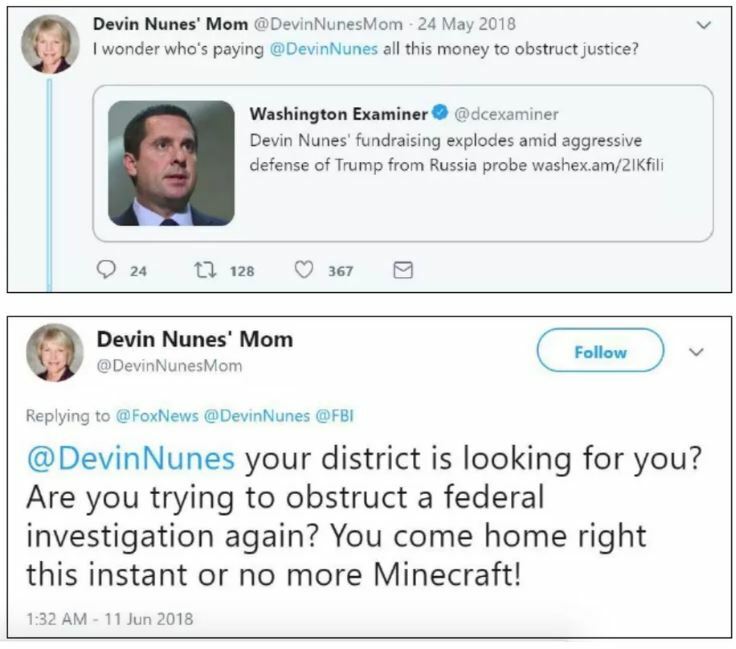 Devin Nunes is suing Initech for $519M because "someone stole his stapler"
He seems to have a fan in the guy he's been brown-nosing for a couple of years. And of course Nunes was on Hannity (another brownnoser) tonight whining about Twitter.